Quassia which is also known as Bitter Wood or Jamaican Quassia generally refers to two plants that are members of the Simaroubaceae family, namely Picrasma excelsa (Sw.) Planch. and Quassia amara (L.). P. excelsa is native to the West Indies, more particularly it is found in Cuba, the Dominican Republic, Haiti, Jamaica, Puerto Rico, Saint Vincent and the Grenadines, and Venezuela. On the other hand Q. amara is native to tropical South America. The name quassia lends itself to a former slave from Surinam, Graman Quassia, who in the Eighteenth Century discovered the medicinal properties of the bark of Quassia amara. P. excelsa comprises a deciduous tree which can grow up to 25 m in height. Whereas Q. amara constitutes a shrub or small tree that grows between 4 – 6 m in height. The wood of the trunk of quassia is white and it becomes yellow upon exposure to air. The principal part of quassia used economically is the bark for which it is now cultivated on a commercial scale. The bark which can be harvested year round has long being valued for several therapeutic properties most notably to treat digestive disorders as it enhances the secretion of bile into the stomach, production of stomach acids and salivary enzymes. It has thus been a popular treatment for anorexia. The bark has also been reported as being useful in treating fevers brought on by illnesses such as malaria and as an effective anthelminthic preparation. In fact an enema made from the bark has been traditionally used to dispel tapeworms, lice and other parasites from the body. Nowadays it is mainly used as a tonic or to impart a bitter flavour and it is used as a flavouring substitute for quinine. In fact the Council of Europe has approved the use of quassia extract derived from both P. excelsa and Q. amara as a category 5 natural flavouring for use in a variety of foodstuffs at levels between 10 – 72 ppm. The phytochemistry of quassia has been studied in some detail. The bitterness of quassia is due to the quassinoids which are degraded triterpenoids or more specifically seco-triterpene–lactones. They are present at levels of about 0.25% w/w in the bark. 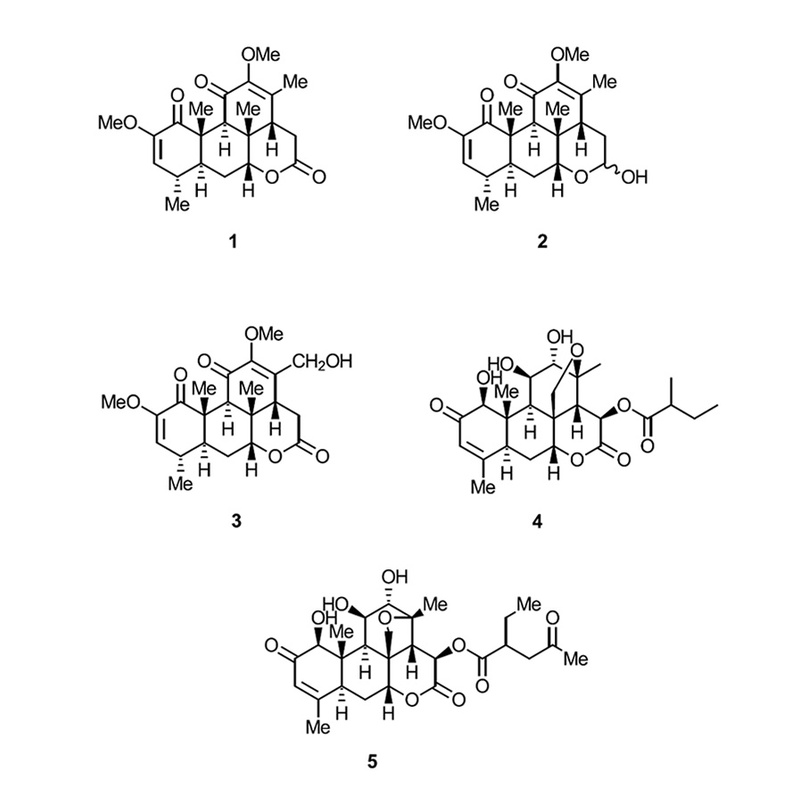 The principal quassinoids found in the bark are quassin (1), neoquassin (2), 18-hydroxyquassin (3), simalikalactone D (4) and quassimarin (5). Quassin with a bitterness threshold of 0.06 ppm is one of the bitterest substances known and it is ranked as being 50 times more bitter than quinine. Quassinoids have been shown to exhibit a broad range of biological activities ranging from anti-plasmodial, antiviral, anti-inflammatory and anti-tumour activity. Other compounds identified in quassia bark include indole alkaloids of the beta-carboline type and coumarins such as scopoletin. Traditional herbal drug preparations of quassia bark include Concentrated Quassia Infusion BPC 1949, Quassia Enema BPC 1949 and Quassia Tincture BP 1948. Ransom Naturals Ltd manufactures QU/07 – Extract of Quassia BPC 1949 which is an aqueous soft extract prepared from the bark of P. excelsa and standardardised to contain between 1.0 – 2.0% total quassinoids expressed as quassin.